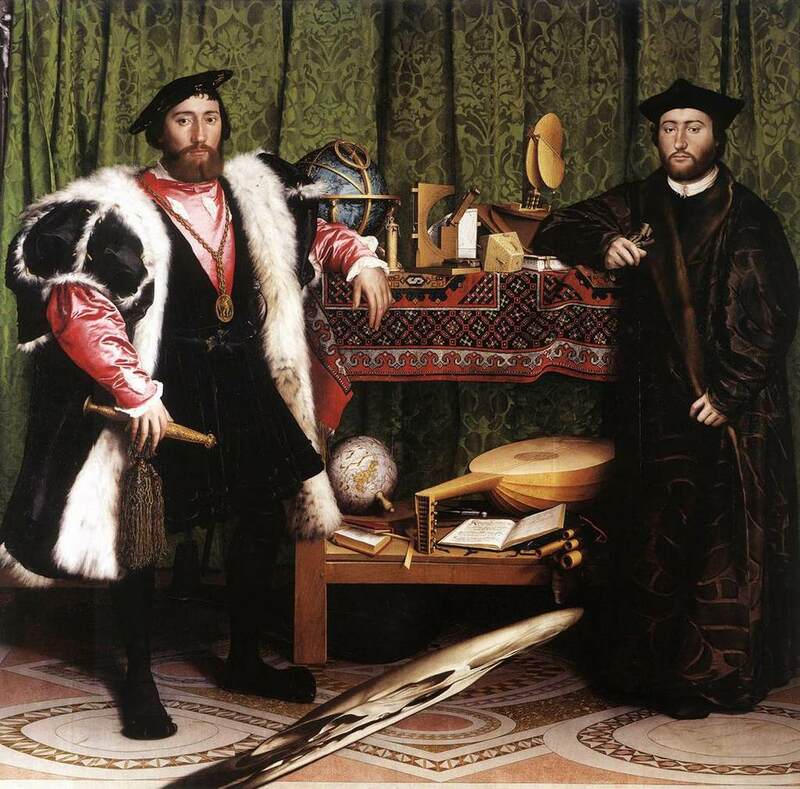 Have been captivated by John North’s extraordinary book on Hans Holbein’s painting The Ambassadors. If you’ve never seen the painting in the flesh, it’s in the National Gallery in London – well worth a peek, not least because it’s free. 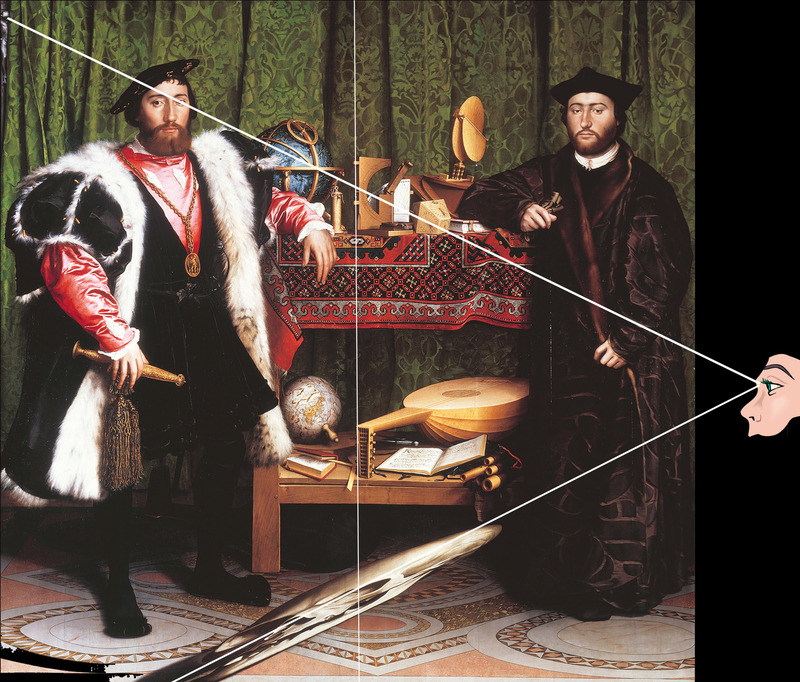 It is monumental and captivating – and one of (if not THE) Holbein’s masterpieces. to the complexities of early 16th century European politics (esp Anglo-French relations), the importance of Geoffrey Chaucer in the court of Henry VIII, Henry’s relations with Rome and the role of Cranmer etc etc. Is there nothing that this man doesn’t know? I have to say that much (most?) of the mathematical and astronomical stuff completely passed me by – but that didn’t dull my interest. I merely read in awed incomprehension and simply thought how marvellous it is that some people understand this stuff – just as long as I’ll never have to really get my head round it. I hope my life never depends on it. So here’s the picture, painted in 1533. The guy on the left is Jean de Dinteville, French Ambassador to the court of Henry VIII. On the right is his childhood friend who came to stay with him while on some sort of official business in London, Georges de Selve, Bishop of Lavaur. The display on the two tables is designed to impress with their learning, wealth and influence – not bad going for 2 chaps only in their 20s. But the important thing to realise is that Holbein isn’t simply showing off his still-life skills. There are a number of hooks to lure us into the picture. For a start, it is not a perfect square – it is 207 cm x 209.5 cm. Accident? I think not. THE FLOOR – is an intricate mosaic floor, based on the remarkable medieval floor of Westminster Abbey. Under the lower table, one can just make out the left hand prong of the 6-sided star of David. THE DATE – this is where it gets really fascinating. Because of the cylinder sundial on the upper table (see below) it is possible to establish the specific date, and even the time of day: 11th April 1533 (notice where that comes in the chronology above) – this is interesting because we know that Bishop De Selve was definitely in London at the time. What is more, in 1533, 11th April was GOOD FRIDAY! And it was roughly 4 in the afternoon. But the curiosities do not stop there (and in fact, there are many more than i can include in this post, and many more that I don’t fully understand). 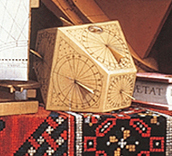 THE POLYHEDRAL DIAL – next to the bishop’s right elbow is this strange scientific-looking instrument (surrounded by strange instruments) which has a number of different faces, and sticky-out things (called gnomons) like the cylindrical sundial above. Quite apart from what it all means (and I was slightly lost here), notice the angle of the gnomon facing us. If you draw a line tracing its angle back and forth, you come across something remarkable. It will intersect off-canvas to the right with the line where your eye should go in order to see the skull correctly. And if your eye is there, looking up this trajectory, your eye will ‘pass through’ a number of key objects. It will intersect perfectly with the horizon line on the astronomical globe on the upper shelf. (see below) That is no accident. But as your eye travels further, you intersect with the Ambassador’s left eye, and then, lo and behold… The crucifix – at Christ’s left eye, to be precise. So what do we make of it all – well – there is much more to be said that can be said. But how about this? It is ambiguous about what was going on in the Reformation at least – yes Rome is central on the globe (as you would expect in a portrait of 2 important Catholic diplomats), but what is Luther’s music doing there? Things are not quite what they seem. 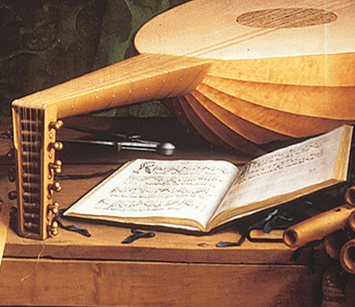 But the most startling thing about the picture is not the accumulation and arrangement of various scholarly, scientific and musical objects. It is the whacking great skull in the middle. That is designed to make us think, at the very least. So what happens if we trace the 2 sightlines mentioned above. 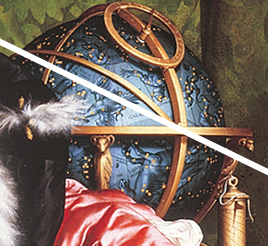 Both are clearly intended by Holbein. Looking downwards: The Skull – the reality of our mortality – dust we are and to dust we shall return. “Alas, poor Yorick! I knew him, Horatio” etc (as the Bard would famously put it 70 years later). Looking upwards: The Cross – the offer of God’s redemption – the heart of the Christian message is what happens on Good Friday. Here is my attempt (after playing around in Photoshop for a bit) to illustrate the various sightlines (acknowledging credit and indebtedness to North’s fascinating book). and then hotspots linked descriptions and explanations of each objects. fascinating. I’d always seen the skull and stopped looking for any further meanings beyond mortality. I have a new respect for Holbein. Is your rendering of the anamorphosis taken from the upper right? It looks like it should be taken from the lower left — that way the left socket (from the skull’s point of view) would not appear smaller than the right. I have heard that it was meant to be hung on a landing with a staircase leading up from the left, so you could see the anamorphosis from this direction. you’re probably right – i was just fiddling around too quickly in photoshop so wasn’t really being very systematic. thanks for the spot. Rod, it was meant to go with the staircase but it was still meant to be viewed from the right. it was the idea of looking down to the earth and seeing our mortality but looking up would lead our view to Christ and eternal life. Thank you so much for your work on this. The Ambassadors has always been a favourite but my understanding of it was, at best, superficial to say the least! I have been ploughing through John North’s book for several weeks now – it is indeed heavy going in places but well worth the effort. Your thoughts, particularly the hotspots, are very helpful as I cannot get to the National Gallery very easily. One question – were your reproductions taken before the recent restoration? I ask because I have not yet been able to find Holbein’s signature. thanks for your comment and encouragement. As far as I can tell the repro is an old one… can’t for the life of me remember where I dug it up now (which is pretty bad i know – sorry). Hello, it’s been a long long time since you wrote this article about The Ambassadors I know. Thank you very much for it any way for it has been helpful: hints on how to look differently at the painting. 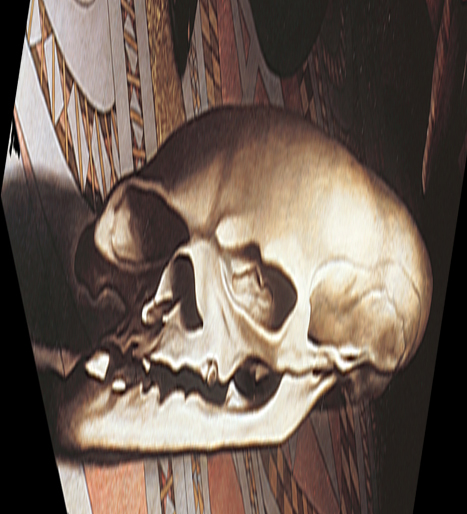 I was told there are two more skulls: one painted on Jean de Dinteville’s hat and the other one, more controversial as everyone I know speaks about it but really now one is capable of seeing it really… (It is supposed to be in one of the two ‘eyes’ of the anamorphosis. Did you ever get to see it? Sorry if my English is not totally correct, I’m still learning it! thanks for your comment (and your English is fine!!) – i’ve not been able to see the other two skulls myself – but perhaps it is like one of those Magic Eye pictures – you can either see it or you can’t! I was able to find the skull in de Diventville’s hat pretty easily using it. Thanks for your breakdown of the symbolism here – it was super informative!! thanks so much for the link – EXCELLENT. What a brilliant site that will prove to be. Glad to have seen the hat skull as well for the first time now!!! It is really a fabulous educational film. I really enjoyed your description, and will definitely go to see the painting in the future. I was looking because of another art mystery I’ve found and the case of the skull being only visible in recognisable form is the only thing I could think of. I went to the recent Leonardo da Vinci exhibition and noticed something regarding La Belle Ferroniere (sp) and the Lady with an Ermine. Thse two ladies were wife and mistress of the same man. They hung at right angles to each other, placed deliberately, I am sure. La Belle Ferroniere (the wife) looks quite content from the front, but if you moved to the right and looked back, she was really glaring at the mistress! I am wondering how you can paint an expression that changes as you move to one side? thanks for this – have been meaning to get to the Leonardo – will check it out! does anyone know the significance ot the medallion on Jean’s chest it is important to me. it will be expensive to call the national gallery. any ideas would be appreciated. I only popped in to the National to keep my son and wife happy. Now I have a project for what remains of life.